My CVs win interviews for my candidates. It’s as simple as that. 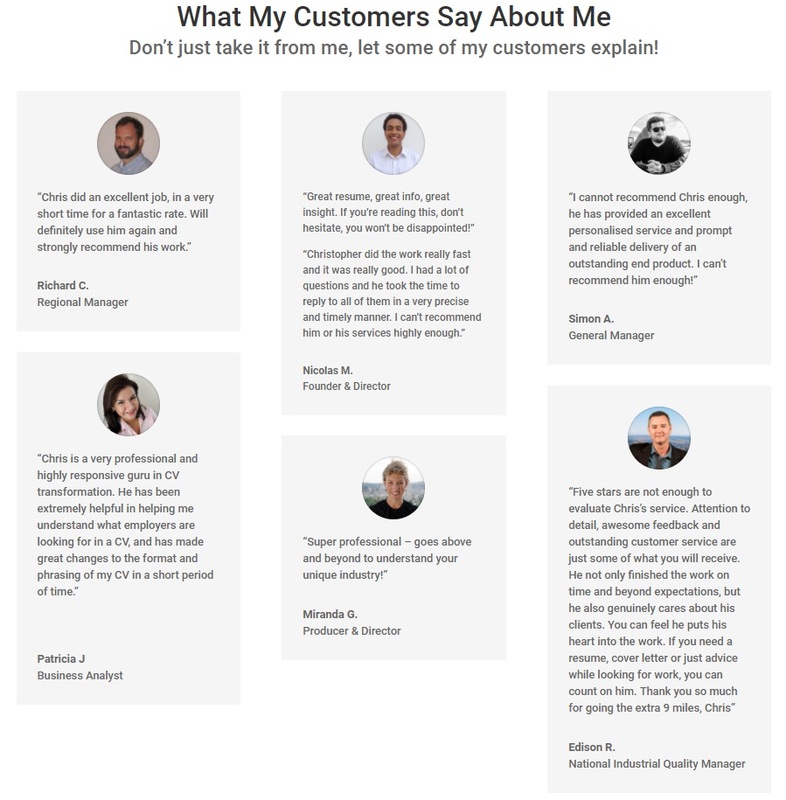 and have a look at my reviews on LinkedIn and below. As of today (11th Jan 2019) I have a 100% track record of every single candidate gaining work within 90 days of having me rewrite their documents. This is a full-service package that will take about a week to ten days, have unlimited revisions, frequent communications back and forth and we will work on this together until you are 100% happy with the final documents. It’s a collaborative process where we work together to really capture you on paper and where we highlight your key skills and strengths in order to win that dream role. • A rewrite and reformat of your CV, a powerful step by step LinkedIn profile guide you can copy and paste and a Cover Letters. • Your CV targeted to the specific job or jobs you are applying for. • Your key skills highlighted in a compelling way. 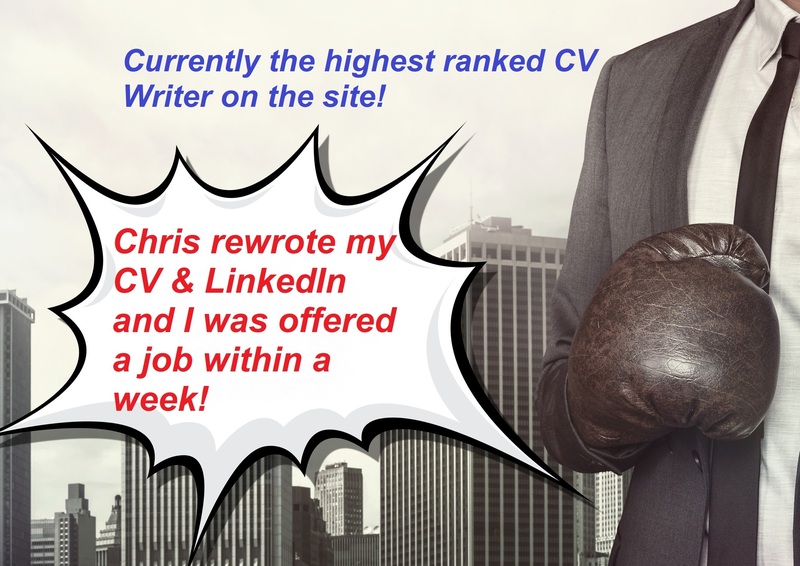 • A CV that it is optimised for ATS & keyword matching. I'm a headhunter now turned CV Writer so this puts me in a unique position to help you, unlike many of my colleagues I’m not a graphic designer or a professional writer pretending to understand recruitment or the hiring process. I actually am a recruiter. I’m someone who reads and writes CVs for a living every day & whose reputation is based on being able to identify great candidates for Hiring Managers and HR departments and I've been doing this for nearly 20 years. I understand exactly what works in a CV and exactly how to grab the attention of key decision makers within the first few seconds. In short, my CVs work! They win interviews for my candidates and they do it quickly and reliably. Your resume or CV is the first chance you get to make an impression, so don’t let it be your last. Note that due to an insane level of demand I am extremely busy and I may not be able to start work on your cv for a week to ten days from ordering so please message me before ordering to check how busy I currently am. If you are at Director or C-Level or above please see my Senior Level package. I need your existing CV and or resume as a word document plus a link to your LinkedIn profile if you have one and any links to specific jobs you are applying to at the time. I will also need your skype id and phone number if you want me to call to talk and discuss your specific needs. I'm always happy to answer questions or explain my process and my teams in greater detail than the space above allows so please message me before ordering. I apologise for the delay in working with me personally but it is only fair that I work with people in the order that they contact me and place orders and rest assured that if you are working with one of my team they are every bit as good as I am ( It took me a long time to find them!) and that I will read and approve every word of anything they do in my name. "I recently had the pleasure of using the service of Chris to recreate my resume, and I'm absolutely delighted with the results and "professionalism during and after completion. Well done Chris and I sincerely recommend the services you provide." perfect & quick job! Thx! Chris did an amazing job bringing my career's achievements out and onto the CV and reducing the amount of the amount of clutter to make it more manageable and easier to read. Chris is very professional and has a wealth of insider knowledge in recruitment. He did a great job of reworking my CV and his guide to reworking your LinkedIn profile is excellent. Chris and team were very responsive. They did a great job, including rework requests. Thoroughly recommend. thanks and always a pleasure to help get it right. Christopher provided a very professional service and produced work of the highest quality. He certainly knows what is required to produce a compelling CV and was more than happy to share his knowledge and insight. I would have no hesitation in recommending him. Thanks for your work Christopher, CV looking looking more solid and my linkedin profile attracting enquiries. Glad to hear the changes are already having a positive outcome. Good luck.